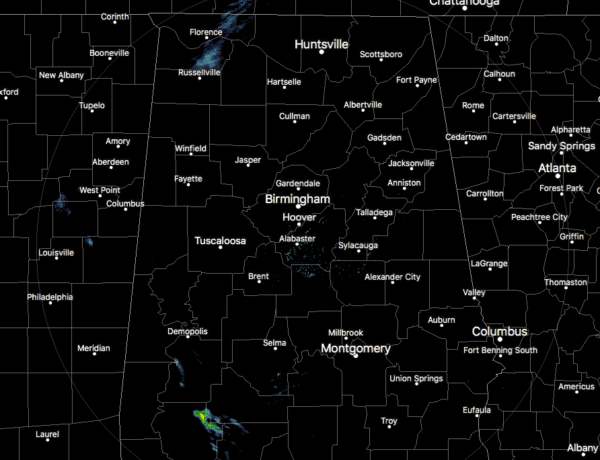 While we nearly have a clean sweep on radar, we do have some spotty shower activity in the southwestern parts of Central Alabama in Marengo and Dallas counties, and down into the southwestern parts of the state. 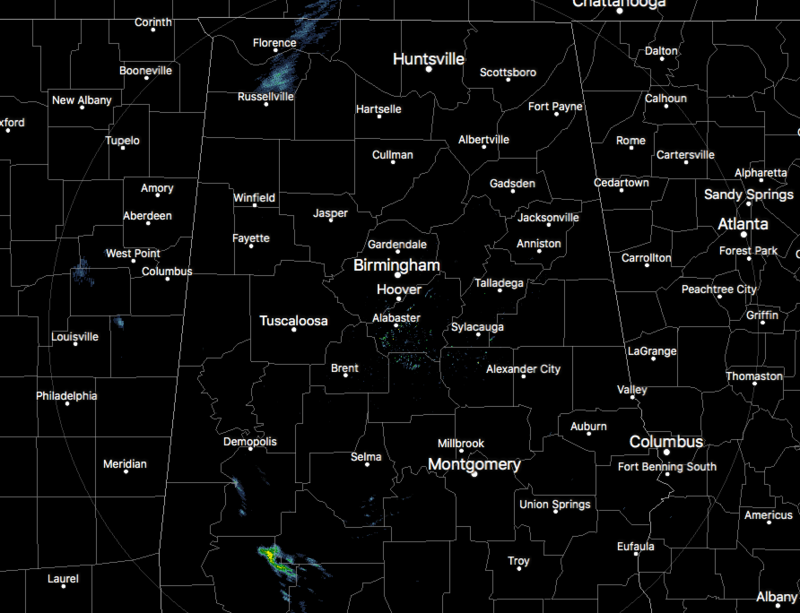 We also see some very light showers over the northwestern corner of the state. All of these are moving to the east-northeast. Skies are mostly cloudy across the area, but there are a few breaks that are allowing the sun’s rays to reach the surface. Temperatures are in the lower 60s to the lower 70s across the area from north to south. We’ll have a very small chance of isolated to scattered showers across Central Alabama throughout the rest of the afternoon and into the early evening hours. Skies will continue to stay cloudy and afternoon highs will top out in the lower to mid-70s across the area from north to south. For tonight, the HRRR is showing the possibility of a few heavier showers moving across the northwestern parts of the area during the evening and into the overnight hours, while the rest of the area will continue to have a very small chance of showers. Overnight lows will bottom out in the upper 50s to the lower 60s. It would almost be an exact duplicate forecast for Wednesday with the exception of the afternoon highs. Skies will be mainly cloudy with a small chance of showers for much of the area. South of the I-85 corridor, you will be rain-free throughout the day, but chances increase as you move north from there, around 10-20%. The highest rain chances will be north of the I-20 corridor, around 20-40%. Highs will be a little warmer, ranging from the lower 70s to the upper 70s. Rain chances will decrease during the nighttime hours, but a very small chance will remain over the extreme northwestern corner of the area. Lows will only make it down into the upper 50s to the lower 60s. 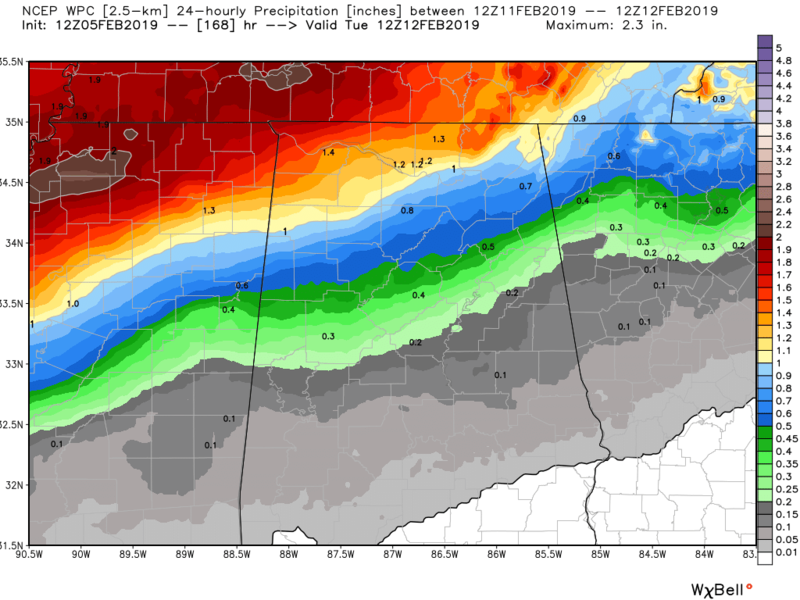 While much of Central Alabama will barely receive any rainfall or none at all, we see that totals really increase as you move north of the I-20 corridor. The northern half of Central Alabama is forecast to receive around 1/2 to 1 inch of rainfall through Tuesday morning, but north of there, totals could reach as high as 2 inches in the northwestern corner of the state. Nearly all of that rainfall will come after the late morning hours on Sunday through Tuesday morning. 2008 – The deadliest round of tornadoes in nearly a quarter century kill 58 people in the south. The storms killed 32 people in Tennessee, 14 in Arkansas, seven in Kentucky and five in Alabama. Damage is likely to be in the hundreds of millions of dollars.